On March 27, 2014 the UN Human Rights Council adopted the draft resolution entitled "Promotion of a Democratic and Equitable International Order" introduced by Cuba and supported by some of the world's worst violators of human rights. The resolution calls for the "the promotion and protection of human rights...based on the principle of cooperation and genuine dialogue" and states that "a democratic and equitable international order requires...the promotion of equitable access to benefits from the international distribution of wealth." It was supported by countries like China, Congo, Democratic People's Republic of Korea, Iran, Sri Lanka, "Palestine", Sudan and Venezuela. The text was adopted with 30 votes on favor, 3 abstentions and 14 against (the U.S., Republic of Korea, Japan, Montenegro, Macedonia and the EU countries). Draft was adopted with 33 votes in favor, 1 against (U.S.) and 13 abstentions (Austria, Czech Republic, Estonia, France, Germany, Ireland, Italy, Japan, Montenegro, Republic of Korea, Romania, The former Yugoslav Republic of Macedonia, and United Kingdom). On March 28, 2014 the UN Human Rights Council adopted a resolution entitled "The negative impact of the non-repatriation of funds of illicit origin to the countries of origin on the enjoyment of human rights". The resolution was adopted with 33 votes on favor, 12 abstentions and only 2 against (the U.S. and Japan). 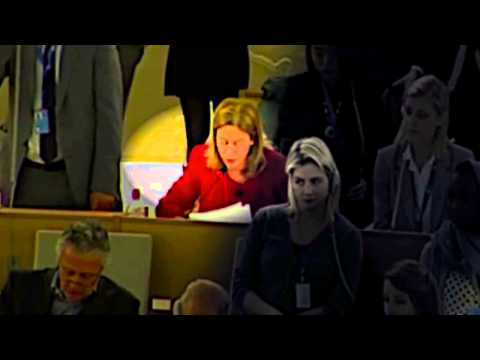 The American UN representative Paula Schriefer explained that the U.S. voted "no" because the resolution "make[s] pronouncements in the highly technical area of asset recovery" which "lies outside the appropriate scope" of the Council. She also pointed out that the adopted resolution did not "reflect valuable progress made by relevant experts in the UNCAC's [UN Convention against Corruption] Conference of States Parties." "Women's Committee of the National Council of Resistance of Iran calls on all international bodies and human rights organizations, especially the UN Special Rapporteur on Extra-judicial, Summary or Arbitrary executions and the UN Special Rapporteur on the situation of human rights in Iran, as well as the bodies defending women's rights, to take urgent action to have the death sentence of Ms. Rayhaneh Jabbari revoked. Ms. Rayhaneh Jabbari, 26, a decorator, was imprisoned seven years ago for using a weapon to defend herself against an agent of the Iranian regime's Ministry of Intelligence and Security. Mrs Rayhaneh was forced to defend herself against the MOIS agent who attempted to assault her. The scuffle led to the death of the MOIS agent. The henchmen of the clerical regime tortured Mrs Rayhaneh in attempts to extract a forced confession from her." 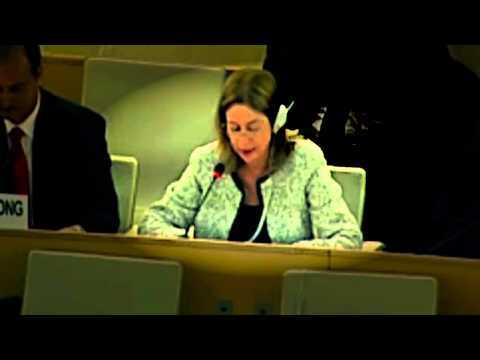 Anne Bayefsky, speaking at the UN Human Rights Council in Geneva, on March 27, 2014. Anne Bayefsky, speaking at the UN Human Rights Council in Geneva, on March 24, 2014. Anti-government protesters try to protect themselves from a water cannon as riot police disperse them during a protest in Ankara June 5, 2013. A woman prisoner is being taken away for her execution after she was sentenced to death at a sentencing rally in Beijing, China. The trial of tycoon and opposition leader Mikhail Khodorkovsky, left, and his co-defendant Platon Lebedev has been called unfair. The UN's top rights body, the Human Rights Council, is planning to adopt a resolution at the end of March entitled "the Situation of Human Rights in the Islamic Republic of Iran". But the draft resolution now circulating doesn't even mention any human rights abuses in Iran. The only thing the resolution will do is extend the mandate of the UN investigator on human rights in Iran for another year. Here are some of the excuses, rationale, thought processes concocted by states in the behind-the-scenes informal negotiations, for treading lightly on one of the world's worst human rights abusers. Sweden said: "We have a short procedural text focusing on the mandate itself....Here at the Council we focus on the special rapporteur's mandate...We hope that this mandate is seen as constructive and as a possibility for Iran to engage." Diplomatic representatives of the European Union and the Netherlands talked about "some improvement in the human rights situation" in Iran. Furthermore, on March 17, 2014 the Council held a "dialogue" with the Special Rapporteur on Iran, Ahmed Shaheed about his latest report on human rights in Iran. While highlighting specific abuses, Shaheed praised Iran for its engagement and "a number of positive overtures." He said: "I am pleased to report that over the past twelve months - both in Geneva and New York - I have been able to hold several general conversations with Iranian officials on a range of important human rights issues raised in my reports, including the one before you. Iran has also responded to 4 of the 25 joint communications forwarded this year about specific cases and perturbing trends, and I also received a detailed response to the report before the Council today...The report before you documents developments in the human rights situation of the Islamic Republic ... including a number of positive overtures apparently aimed at advancing President Rouhani's campaign pledges to strengthen human rights protections and at remedying some cases of human rights violations...I had the distinct pleasure of meeting on Friday His Excellency the Permanent Representative of Iran, along with a delegation of distinguished Iranian judicial, legal, and diplomatic experts and officials to discuss issues raised in the current report..."
The flattery was strange, considering that the same Special Rapporteur has actually never been admitted into Iran to investigate human rights abuses there. In fact, no UN Special Rapporteur on human rights abuses in Iran has been admitted into the country since 1996. During the Council "dialogue," Iran didn't find it necessary to reciprocate the Rapporteur's unfortunate grovelling. Instead, it responded this way to his report: "The report...is a compilation of unfounded allegations. It does not appropriately address Iran's enormous advancements – specially its distinctive democratic nature....The report has also chosen to pay no attention to Iran's significant achievements. It ignores the fact that women in Iran are highly educated and present in all walks of the society's life...We are firmly committed to the promotion and protection of human rights at the national and international level...For centuries the dynamic Iranian society has been admired as a successful example of peaceful ethnic and religious co-existence." Apparently, that's enough to ensure that the UN "Human Rights" Council doesn't condemn a single human rights violation in Iran.